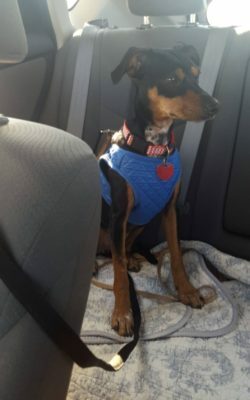 Topeka, KS – Doobert.com volunteers transported one rescue dog from Junction, TX to her forever home in Topeka, KS this past week. After being p icked up off the streets, Sadie ended up in her local city shelter. When the shelter became too full and reached capacity the shelter called Sam Coffey Animal Rescue Facility (SCARF). They picked up several dogs that day who were placed in foster care. Sadie had been overlooked and remained in the shelter. Sadly, no one knows why she was left behind. Just in time, an adopter was looking to adopt a Rat Terrier Mix. Jody, who is familiar with the breed knew what kind of personality she was looking for. Right when she saw Sadie, it was love at first sight! Now, Sadie had to find her way from Texas to Kansas. After posting on Facebook for volunteers, they came across the transport group, R.A.C.E. The shelter contacted R.A.C.E and they took it from there. Within just one week there was a plan was set to take Sadie all the way to meet her new Mom! Sadie traveled over 700 miles from Junction, Texas to Topeka, Kansas. Sadie and her new mom were very excited and could not be happier. She is now in her new furever home!